Easily adds studio reverb polish to live vocals by offering pro acoustic spaces from lush halls to tight ambience. Get more control over studio quality reverb with the easy-to-use VoiceTone Single R1 Vocal Tund Reverb pedal. With reverb algorithms ported from TC-Helicon's flagship VoicePro processor, VoiceTone R1 is capable of surrounding your voice in a warm ambience. Initial reflections, decay time and tail tone have been optimally balanced in the eight pre-set reverb styles so you can find the perfect sonic pillow for each song. Gaining access to the studio quality sounds and intelligent processing of the VoiceTone R1 is as simple as plugging in your mic and turning the effect on. Of course, you can always change the style or the amount of effect. The TC-Helicon VoiceTone Singles series includes four vocal processing pedals, each with a single mission - to allow any vocalist to deliver jaw-dropping performances. 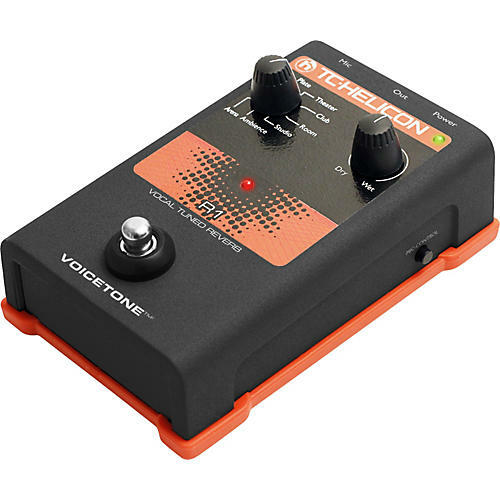 VoiceTone Singles are the ultimate combination of tone and simplicity. Each of the four effects has inherited algorithms from the award-winning VoiceLive 2, so although VoiceTone Singles come in small packages they deliver a big sound. Take your voice in a new direction with more dimensions. Order today.